When you are shopping for a luxury wagon, you want to find the best option out there and purchase that. 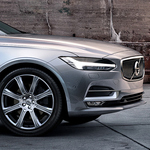 If you care about the way that a vehicle performs, you should look into the Volvo V90 and the features that this popular option offers. Are you someone who is concerned about the amount of fuel that a vehicle can burn, especially when you are doing a lot of city driving? If so, you should consider the Volvo V90 for its Start/Stop technology. This vehicle shuts off its engine temporarily when you are stopped at a red light and then gets that engine going again when it is time to start moving. The way that your vehicle steers should make it easy for you to drive, whether you are going fast or slow. The steering of the Volvo V90 adjusts along with the speed of your vehicle, keeping you fully in control.